And these were the cards that I made to go with the stamp set for the lucky door prize. 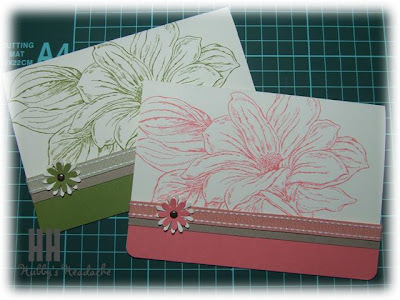 As you can see, I have used the Hostess stamp, From the Garden, and have cased these straight out of the current SU catalogue to show the girls how easy, quick and beautiful these cards are and what a great stamp to have. And I was quite amazed myself as to how nice they turned out 'cause they really are such a nice simple idea. Lovely Deb. You did well. Haven't visited in a while Deb - you've been a very busy beaver!